Every once in awhile, we will read an op-ed or article that clearly explains the nuances of something we are interested in far better than we have been able to do. We agree with most of his points, and since he was a budget policy director for Majority Leader of the Senate Trent Lott for many years and a fellow colleague on President Bill Clinton's Entitlement and Tax Reform Commission in 1994, we trust his understanding of parliamentary procedure and Senate rules far more than we trust our own. Now that the Supreme Court has ruled ObamaCare's individual mandate constitutional, the direction of American health policy is in the hands of voters. So how do we get from here to "repeal and replace"? Step one is electing Mitt Romney as president, along with Republican House and Senate majorities. Without a Republican sweep, the law will remain in place. Reconciliation allows a bill to pass the Senate in a limited time period, with limited amendments, and with only 51 votes; filibusters are not permitted. In 2010, Democrats split their health-policy changes into two bills, one of which they enacted through this fast-track process. 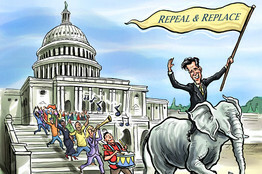 In 2013, a Republican majority could use the same reconciliation process to repeal those changes.But a President Romney does not need 60 Republican senators to repeal core elements of ObamaCare. Democrats lost their 60th senate vote in early 2010 after Scott Brown took Edward Kennedy's seat. To bypass a Senate GOP filibuster and enact portions of ObamaCare, they used a special legislative procedure called reconciliation. The reconciliation process, however, applies only to legislative changes to taxes, spending and debt, or the change must be a "necessary term or condition" of another provision that affects taxes or spending. Crucial parts of ObamaCare meet this test. Thus, if a President Romney has cohesive and coordinated majorities in the House and Senate, a reconciliation bill could repeal the Affordable Care Act's Medicaid expansion, insurance premium and drug subsidies, tax increases (all 21 or them), Medicare and Medicaid spending cuts, its long-term care insurance program known as the Class Act, and its Independent Payment Advisory Board, a 15-member central committee with vast powers to control health-care and health markets. Chief Justice John Roberts ruled that the financial penalty enforcing the individual mandate is within Congress's constitutional power to "lay and collect Taxes," and that the mandate and penalty are inextricably linked. This should suffice to enable repeal, through reconciliation, of both the individual and employer mandates, and their respective penalty taxes. The state exchanges and insurance rules—"guaranteed issue," which forces an insurer to sell a policy to someone who is already sick, and "community rating," which severely limits the insurer's right to charge that person a higher premium—are procedurally more difficult. Yet both are linked to the individual mandate, which increases taxes. Whether they can be repealed in a reconciliation bill will ultimately be decided by the Senate Parliamentarian. Once the individual mandate is repealed, these popular insurance changes cannot stand by themselves. Without the mandate, people have every incentive to save on premiums and not buy insurance until they fall ill. This will send premiums through the roof for healthy people and, if the government clamps down on increased premiums, destroy private insurance companies. Those Republicans who say they favor legislated guaranteed-issue and community-rating requirements but oppose the mandate will be forced to acknowledge that all three must go. Repealing core parts of ObamaCare cannot take place immediately. The opportunity to use a reconciliation bill requires first passing a budget resolution, something the Senate Democratic majority has not done in three years. This, too can be done with simple majorities, but realistically it would take until April to pass a budget resolution, and to enact a repeal through reconciliation in May. The president and his allies argue that ObamaCare reduced the deficit, and that repealing it would mean a deficit increase. That claim was always laughable. In any event, the Congressional Budget Office is now re-estimating the effect of repeal on spending, taxes and deficits in anticipation of an upcoming House vote, scheduled for next week. Repeal may look fiscally more attractive in coming days than it did two years ago. If the new CBO estimate concludes that repeal would increase the deficit, then those favoring repeal will just have to make more spending cuts. Given the size and rate of growth of government spending, it's not that hard to do. Repeal and replacement should be separate legislative efforts. This will allow more opportunities to create bipartisan center-right coalitions. Future Republican majorities can work with moderate Democrats to enact needed insurance market reforms and the bipartisan Wyden-Ryan Medicare reform plan, which provides a stronger system of competing private health plans as opposed to government-run "fee-for-service" Medicare. Piecemeal reform does not mean incremental reform. The pre-ObamaCare status quo is unsustainable and unacceptable, and a President Romney and his allies must be as bold in their pursuit of consumer-driven health reform as President Obama was in his pursuit of government control. Reform should start by replacing the tax exclusion for employer-provided health insurance with a flat tax deduction or credit. This should be combined with insurance reforms that allow consumers to buy portable health insurance sold anywhere in the nation, through their employer or on their own. That means you'll be able to take your health insurance with you from one job to the next. Tax policy will no longer push Americans toward lower wages in favor of more expensive health insurance. Top it all off with expanded contribution limits for health savings accounts, aggressive national medical liability reform, and structural Medicare and Medicaid reforms that dramatically slow the growth of government and deficits. In 2009 and 2010 the nation took huge steps down a path toward more government control of health care. A shift to the consumer-based reform path is still available—if voters want it. Mr. Hennessey is a fellow at Stanford's Hoover Institution. He served as director of the National Economic Council for President George W. Bush.